Laura Antolin, the children's outreach librarian at Evanston Public Library, drags crates of books from her car on a dolly into the Oakton Elementary School gymnasium. Three huge crates stuffed with hard covers and paperbacks. "At the beginning of the year I bring too many books and figure out what they like," she says. "Graphic novels are big. Diary of a Wimpy Kid. The Al Capone is the third in this group of books, so I think maybe…?" she trails off. Antolin holds up a book titled Twintuition: Double Cross, the fourth and final book in a middle-school targeted series from TV stars Mia and Tamera Mowry. She is setting the books up in a long, arced display on the floor of the gym stage. Triple digits worth of books of all kinds – novels, biographies, comics, fact books. "I want there to be some representation (of the group demographics), particularly in the chapter books," she says. "They will all come running to look." She's right. It's a nice day outside. It's the end of a long school day. It's a room that begs for kids running and outside voices. Yet, when faced with a staged filled with adventures and gripping imagery, the children are focused on making that great find. "(These visits) provide the children a lot of choice," says Y.O.U. Coordinator Emily Fishman. "A lot of the kids read the same books month after month, so they can talk about it with each other. There is a lot of book talk happening between the students. I like to make sure the staff members are getting engaged in what the students are reading, as well," she adds. Antolin makes regular after-school program stops. At Dawes Elementary School, she works closely with Y.O.U. Manager Simone Hampton. "The Library coming has been a staple in this program," Hampton says. "It helps promote that resource in the community. A lot of our youth don't get to go to the library with their families. Having the library come to them just works that much better. "For Laura to come in to our space makes a world of difference," she adds. Sometimes it's a morning visit, as with the Doorway to Learning daycare program at the Joseph E. Hill Administration Building. Sarah Sheikh is a coordinator there helping wrangle 10 children under the age of three. "It stays in the community, not with someone random from outside of the community," she says. "Laura also comes in and does parent classes to expose them to where they can get resources." On this morning, Antolin and Sheikh are pretending with the children to make and eat pizza. 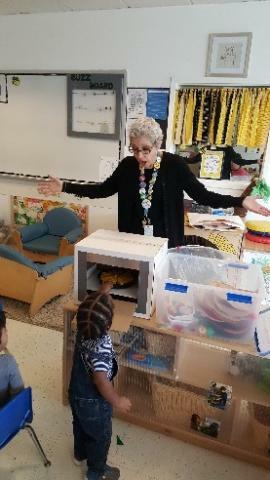 The cardboard oven provides the never-ending gift of plastic pizza to the smallest of students who are just learning to say the word "pizza." It is a loud and celebratory activity that includes early writing and counting. The Library developed a curriculum called Literacy Education at Play (LEAP). It focuses on building those early math, language and writing skills through play; skills the children will need when they get to pre-school. "It is a sequential thing and narrative, too," Antolin says. "They are gaining plenty of skills before they even know they are learning them. We are starting them as early as we can." She notes that the skills are built through play because that is how they learn. That is the work of kids. The Evanston Public Library promotes a vision of developing literacy of all kinds. That plays out through evening programming, as well. On a Wednesday night at the Main Library, 10 children aged six-to-ten years old and their parents are crowded around Jason Coleman as part of the STEMeX program. Coleman is a mechanical engineer by trade who studied at the University of Southern California and worked at BAE Systems and Motorola. In 2008, he left corporate America to found Project SYNCERE, a STEM-focused non-profit based in Chicago. "When I was these kids' age, I had some similar opportunities at the Museum of Science and Industry, but I had no clue as to what engineering was," he says. "I want them to get excited about what engineers do. We do a lot of these not only in Evanston, but in libraries around Chicago." As he describes the importance of instilling STEM literacy in younger children amidst the blaring of digital alarms they are working on, one of the students gets his attention to help close the circuit in the door alarm she is building. The STEMeX program is possible through a partnership with Loyola University Chicago, where the program was designed, and Chicago Children's Museum. The program has been held at the Gibbs-Morrison Cultural Center, and Antolin is working to get a third iteration at Robert Crown. "In addition to hands-on activity, each program features a narrative from experts like Jason focused on how they got interested and involved in a STEM career," Antolin says. "The children need to see there are lots of different entry points to science that they may not be aware of." The program also helps Loyola psychology researchers understand how storytelling helps motivate child learning and how interacting with family during that learning impacts efficacy. One week highlights the different forums Evanston Public Library engages children, as well as the different resources brought to them. From morning to night, children's outreach efforts pack the week.